Everybody likes to think they’re doing a good job. You probably are. But how do you know? Because you’re getting few, if any, complaints? Because you get sincere thanks and compliments from time to time? Okay, that’s nice. But how do you really know what’s going on in the minds of your clients … and what may be stuck in their craws? Bottom line: You can’t know … unless you ask. Conducting structured interviews with your clients isn’t a nice, optional thing to do. It’s essential. It’s really the only way to know how well you’re doing and how you could do better. In this article, I want share with you what I’ve learned from doing innumerable client interviews over the years … the dos and don’ts … the ins and outs … because it’s easy to make mistakes and/or not have the process yield the results you’re looking for. But when you do them right, the benefits can be substantial. Enhance communications, which helps grow and deepen the relationship. Show the client the firm truly values the relationship. Help the firm increase its knowledge of the client, which helps you provide better service and better target the client’s needs. Identify and solve problems that could be lurking beneath the surface. Create new business development opportunities and identify opportunities to cross-sell. Help you uncover information that may assist in the firm’s strategic planning efforts. And let’s face it, if you’re not focusing on client relations, client satisfaction and client loyalty, your competitor, who is no doubt already circling your client looking for a chink in the armor, will have an easier time wooing your client away. But you can’t interview everybody, at least not in one go. Your biggest revenue producers over the last few years. Ask your billing department to give you a list. Those with whom you have a good, longstanding relationship … someone you can really talk frankly with. Clients who are ripe for cross-selling, where the opportunities for doing additional work and increasing revenue is greatest. Clients where revenue has been decreasing, signaling a possible problem. Anyone your intuition suggests is a good candidate. How many people is that? Likely three to ten. Obtaining an updated snapshot of the client’s wants and needs, strategic plan, company direction, changes in personnel, business concerns, upcoming opportunities, etc. It’s no coincidence new work so often comes out of these discussions as the interview subtly morphs … during the interview or later upon follow-up … into a discussion of new possibilities and opportunities to collaborate. Who Should Conduct The Interview? Let’s start with who probably shouldn’t … the attorney who handles the client’s legal matters. Yes, there’s the advantage of existing personal connection and intimate knowledge of the client’s situation, but clients are typically more open with their thoughts and opinions when it’s an outsider asking the questions. You could send the client relations/marketing director. That can work. But experts will tell you it’s best to hire an outside consultant for a couple of key reasons. Clients are typically more open with an outsider, but, just as important, the consultant has been trained to conduct these interviews and knows how to tickle out concerns or problems that may otherwise remain hidden. Plus, hiring a consultant means this is a serious project with deadlines that’ll be met. And a consultant serves as an objective party, able to help the firm analyze the responses and respond to feedback appropriately. One way for firms to involve both attorneys and a consultant in the interview process is to have the consultant conduct the initial interview. You then have a senior management member visit the client shortly thereafter to discuss the results, determine next steps, if any, and help solidify any business opportunities that arose during the interview. Invite the chosen clients to participate. Tell them what to expect, who will be contacting them, and point out the benefits to the client … a more in depth understanding of their needs and desires. The best person to make the initial contact is the attorney with the existing relationship. Interviews should last 45 minutes to an hour and the majority of the time should be spent listening to the client and taking detailed notes. This isn’t a sales pitch. If the interviewer is someone from the law firm, that person can’t become defensive if he or she hears a criticism. That’s the quickest way to derail the interview and potentially harm the client relationship. Send a thank you note and tell the person when they’ll hear back from you. Compile a report of each client interview, as well as a comprehensive report that identifies themes, issues of concern, or trends that became apparent across the interviews. The interviewer should meet with the appropriate client service/relationship attorneys to debrief the interview and discuss next steps, creating a strategy for responding to specific client comments, as well as responding to issues of concern … or opportunities. Finally, the client relationship attorney should follow-up directly with the client if there are issues being addressed that merit additional personal attention. You, and I, and your clients … we all share something in common. We all want to be heard. 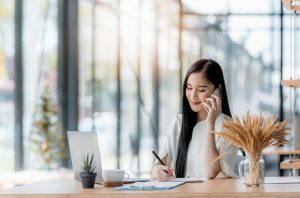 By conducting these interviews, you’re giving your clients the opportunity to be truly heard, and the benefits of that to both of you can be profound.